Replacement: None. We are no longer carrying this widget. This page is for reference only. 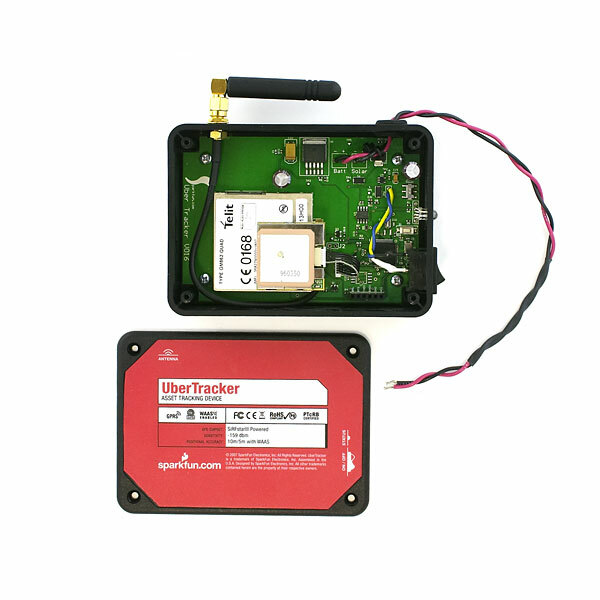 The UberTracker represents a merger of GPS and Cellular technologies into one package capable of real-time asset tracking. 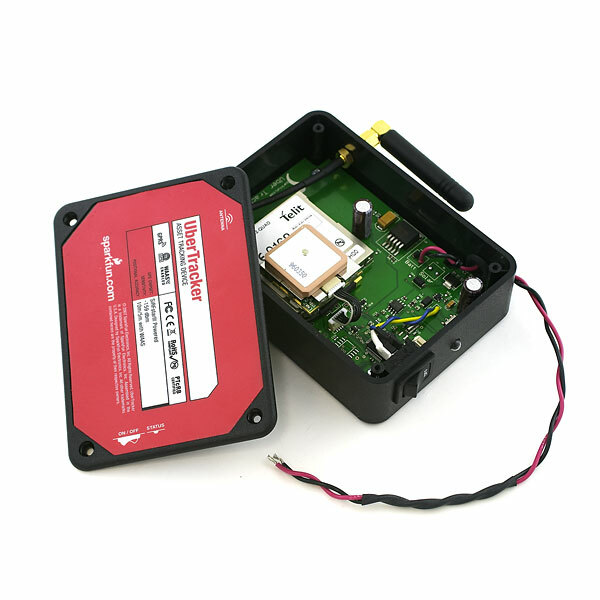 Utilizing a Telit GM-862 Quad GSM cellular module and a US Globalsat EM-406 GPS module, GPS fixes are taken according to a user specified interval, then reported via email or GPRS to the user’s designated email address or web server according to a user specified number of logs per report. The UberTracker is designed to work with a 6V input, or between 8V and 14V with the use of the included regulator module for use in automotive applications. It uses the Telit GM862 Quad GSM cellular module and the US GlobalS at EM406 GPS SiRF III GPS module. 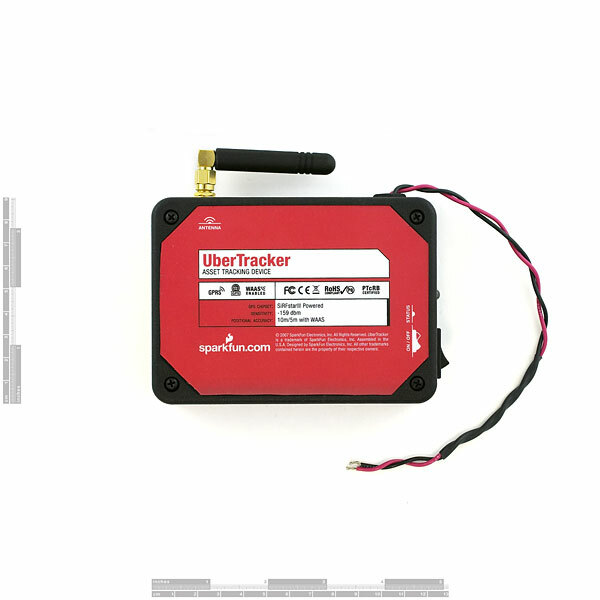 The UberTracker is FCC and PTCRB certified. Use of this device requires a SIM card with an active AT&T Wireless data account configured for GPRS, preferably an unlimited account to avoid the possibility of excessive data fees. An unlimited account is not necessary, though we do recommend it. If the user wishes to alleviate themselves of the hardware, configuration and network support of operating an UberTracker, we invite them to visit our tracking partner Track America. The UberTracker comes with a programming adapter with which to do device configuration, a 12V to 7V power converter for automotive applications, and a set of wire nuts for easy installation. Anyone know if an active SIM card from an iPhone would work in this super duper machine? Will this device work with network operators other than AT&T ? The code looks like it has some network supplier specific stuff hard coded in (Cingular) and so you may need to recompile in order to use a different network supplier. 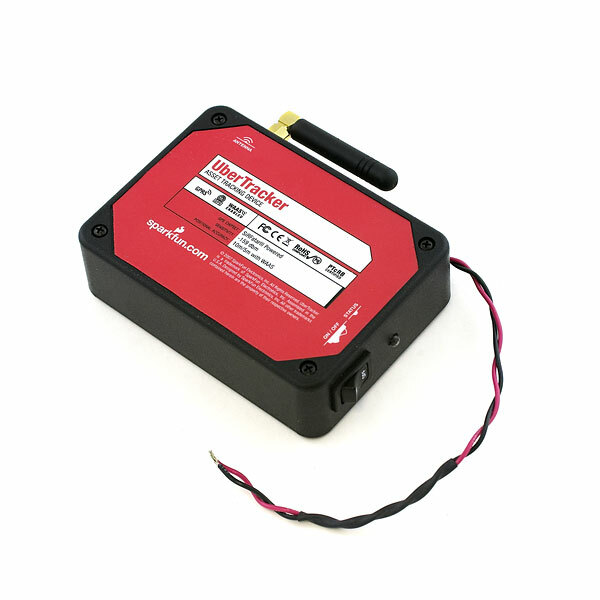 The power system for this Tracker supposes a LiPoly battery with protection like the ones you sell here, but only to know is it safe to charge the LiPoly battery with an LM317? Have a stupid problemâ¦ need help!! Last year I bought ubertracker, changed the main.c file in the firmware zip file âUber_Tracker_12_18_07.zipâ, opened the project with CrossStudio 2.0 and compiled and generated the .hex file. Then, I used this file to put in the uP with the flash utility. Now the stupid part: I donât know anything about crossworks or crossstudio and Iâm trying to do it again because I changed the main.c and I need a new .hex file to upload to the uProcessor. Can someone help me to configure CroossStudio so I can generate a new .hex file???? what compiler or development environment is used to use the source code ? Got my new Ubertracker. Went over to the AT&T store and acquired a GoPhone SIM, with 500MB data enabled. Checked it on a mobile phone, worked fine, able to send SMS and surf. After configuring UT to have a GPS lock interval of 5min, number of logs per report to 1, and send an email to my gmail account, I would expect to see it wake up, send a message, and then return to sleep for 5 minutes before repeating. So far, no messages. Is there a debug interface so I can see what's going on? The red LED on the GPS works as expected, it took a minute or two when first powered up out of the box to acquire GPS lock, was solid red then when it got lock it switched to blinking red once every 2 sec. That seems ok. The multicolor LED on the mainboard is pretty cryptic. 1) When first powered up, it blinks green/red multiple times for about 1 second, then goes dark for 6 sec, then solid red for about 35 seconds. 2) Mainboard LED starts blinking blue. Does this for about 85 seconds, then goes dark for 5 minutes. 3) Go to 2) and repeat. The 2-3 cycle seems to be the reporting interval, but I don't think it's acquiring the network and sending info. Any ideas? Still no luck - did measure battery current to see what might be going on, using 6.0V supply, current when as far as I can tell only the GPS is running is 110mA. Current spikes every 5 minutes (my lock interval is set to 5 min) to several hundred mA (can't read peak current, but the Telit module indicates as much as 2000mA peak current), so several hundred on my averaging multimeter indicates to me that the cellular module is transmitting. I checked my Gophone account this morning and I do see some activity from yesterday, but it was during the time I had that SIM card inserted in a test cellphone, and not when I was trying to run the Ubertracker. Based upon this, it certainly looks like it won't work properly on any other network but AT&T. My next step is to take it over to the local AT&T celltower, stand under it and see if it's just deaf and can't hear the network from the house, even though my ancient GSM cellphone reports 5 bars in EDGE mode. If anyone has been successful in using this, I'd really appreciate the feedback. Bought it in 2010; I live in Portugal. When I got this (although Iâm not familiar with LPC21xx) I changed the firmware code to match my simcard cell company in nain.c using CrossStudio 2.0. So, check your parameters, for sure everyting is ok, your GPRS definitions are wrong - check the main.c file. In last case, change the gsm moduleâ¦ or, like I did, take it from the ubertracker and connect it to the computer via rs232 (donât forghet the ttl levels) and use AT commands with HyperTerminal, itâs very easy to send sms. Some help on how to configure this for other non-ATnT cell networks, please? I would like to put one of these into my mountainbike but as I don't want to have to pay data fees every month I want to use a prepaid SIM card which will start sending e-mails with the bike's location when it receives a text message. Is this possible? any luck on getting this to work for your bike? if so, what pointers can you provide? A pre-pay SIM card should work fine, just watch your GPRS connection availability out in the boon-docks. The triggering so that it only sends after a txt message from you would not work out of the box, you would have to programme that but ask SparkFun to add it to a future version. How do I compile the source code ? did you ever figure out how to compile the code ? This will not work with SIM cards from the new iPhone 4, as those cards are a different size. Has anyone been able to (remote program) change the trackers reporting profie via SMS text message? This is theoretically possible but the supplied code doesn't have this functionality. You would need to programme it yourself. I have an iphone 4, like I need anything else to have to do with AT&T's low-end service. I'm curious as to how accessible the hardware is. Example, I would need to connect this hardware to an external serial device. Prior to making a transmission, the information on my device would be pulled off, then bundled up in the cellular transmission to a web server. How could this be achieved with the UberTracker? I have a bunch of GM862-GPS modules (more than 10) leftover from an old project. 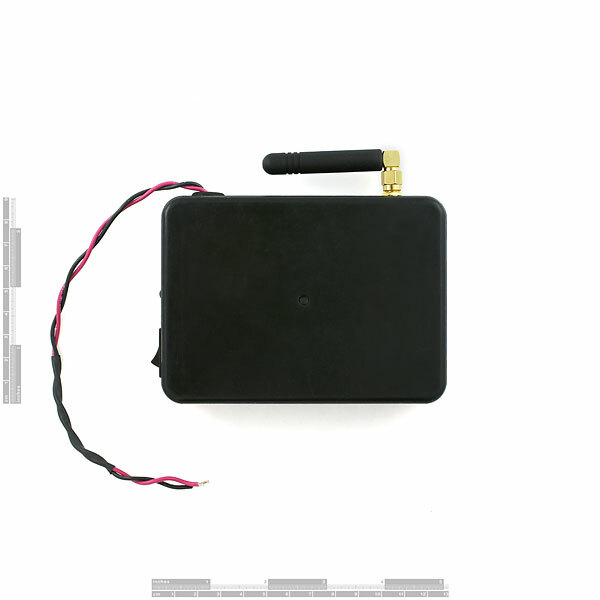 Can I buy Ubertrackers without the cell module? Is there anyone who use Uber trucker in other network, not AT&T? Second question : have you seen problem like this: uber trucker send the information to e-mail for aproximately 1 month, but after one month it stop to send information. Then I configure uber trucker again. Use different e-mail adress, different GPS lock interval, change number of logs per e-mail. And it works again. It works ok for 15..30 days and then e-mails are not coming again. Is there someone who has experience with uber trucker like this? The cellular module is GSM and so any supplier that uses GSM should work, not sure about the US (you have some unusual cellular stuff over there) but most of the rest of the world uses GSM and so I guess it is set up to use GSM so that it has the widest possible market. Would there be any walkthroughs ? sample source code or a link to anybody that has done some programming on this baby ? any chance i could get the source code for this thing? really interested, just wanted to make sure i could tinker around with it and not just use it out of the box..
Hi Pete I bought this and I am trying to find resources for compiling the code. no luck i attempted to use a gophone att sim card with data plan on it and had no luck as well. looked through the code and found legacy name of cingular network. do you guys have an update to the firmware for this thing. and if not could you provide some step by step tutorial on how to get the code to compile. Ever going to put up the schematics for this one?